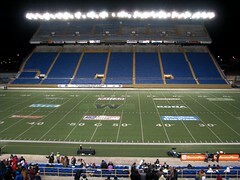 On August 14, 2011 the Winnipeg Stadium, (now Canad-Inns Stadium), turns 58. Barring a major construction setback on the new facility, this will be the final season for the venue. In this series I look back at the history of the Stadium and some of the great moments that took place there. From the 1930s to the 1950s the Blue Bombers played at the Osborne Stadium located west of the Legislature Building where the Great West Life building now sits. While cities like Montreal, Ottawa and Edmonton were building new post-war stadiums with a capacity of 9,000 to 14,000 seats, Osborne only held 5,000 and thousands had to be turned away on game day. In the 1940s the city owned a parcel of land north of the Polo Park Racetrack that it envisioned one day becoming home to a new stadium, arena and exhibition grounds. In 1946 a group of businessmen approached the city with a plan for a new stadium. The catch was that it required a large civic subsidy and ongoing tax breaks. The debate as to whether the city should support the plan was fierce and it lost a money bylaw referendum in both 1946 and 1947. In 1947 a naming contest was held for the yet-to-be-built complex and the winning entry was Redboine Gardens. September 23, 1950. Winnipeg Free Press. 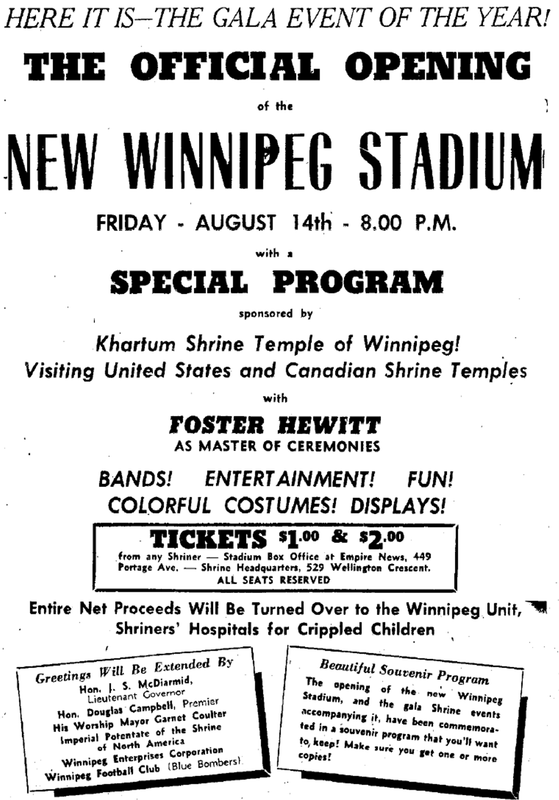 In 1950 a new plan came courtesy of the Greater Winnipeg Stadium Campaign, organized by the Greater Winnipeg Co-Operative Sports Society Ltd., a committee of dozens of local sportsmen under president Harold V. West of Garfield Street. Their campaign kicked off on May 1, 1950 but was suspended days later when the Red River flooded the city. It resumed on September 5. The organization's goal was to raise $300,000 in just five weeks but it never materialized. Three weeks into the five week campaign just $6,490 was raised in a city still drying out from a major flood that saw plane loads of aid being flown in from as far away as Britain. 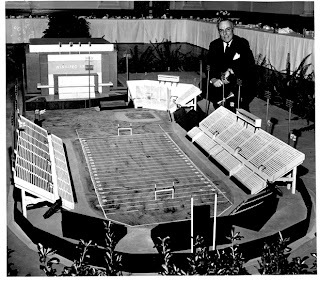 In August 1951 a group of private businessmen headed by local sports promoter Alex Turk made an offer for part of the Redboine Gardens site to build a stadium. The city was reluctant to sell and have its premiere outdoor facility privately owned. In November 1951 cit alderman John Blumberg told the finance committee that he would bring a motion before council to have the city study the feasibility of a new stadium. He realized that the city likely wouldn't fund the construction, but felt that they needed to bring leadership to a growing number of grassroots groups that were calling for, or actively working toward, a new facility. 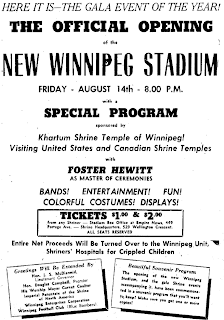 In 1951 a non-profit corporation was created by president of the Winnipeg Football Club W. Culver Riley to work with the city on a new stadium plan. The only site considered, it appears, was Redboine Gardens. This corporation, (forerunner to Winnipeg Enterprises), secured a $500,000 loan from the Great West Life Assurance Company, repayable over 20 years. They asked the city for a donation of the Gardens land, which was assessed at $35,000, and exclusion from property taxes. In exchange, the city got a stake in the corporation, provided the upkeep of the turf through their parks department and could take over the facility at any time. On January 11, 1952 the city gave provisional support for a deal that would see a 15,000 seat stadium, expandable to 34,000, built at the Redboine Gardens site. Construction began in the fall of 1952 with some delays due to a post-war shortage of steel. 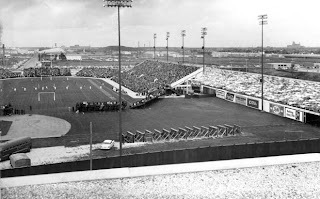 By the spring of 1953 things were on track and a date for the official opening was set for August 14, 1953, the day before the Bombers hosted an exhibition game with the Ottawa Rough Riders. The Shriners made a pitch to make the opening ceremony a fundraiser for their Children's Hospital. The Bombers and city agreed. This brought in thousands of Shriners from across North America as well as one of their Hollywood patrons, French actress Corrine Calvet. Foster Hewitt was the emcee. The Bomber and Ottawa Rough Rider players were were also included. August 13, 1953, Winnipeg Free Press. The event began at 6:30 p.m. with a huge parade from the old stadium to the new facility via Ellice Avenue. Thousands of Shriners marched and played. "Some years ago, I took part in the official opening of Maple Leaf Gardens. That same year, the Toronto Maple Leafs brought home the Stanley cup. Maybe history will repeat itself and the Blue Bombers will come home with the Grey Cup this year !" Corrinne Calvert added more star power. She was carried in on a platform by Ottawa Rough Rider players and brought to the stage where she was declared Queen of Winnipeg Stadium. Mayor Garnet Coulter announced "It is with pride and pleasure that I formally declare the stadium open" which was followed by a six-gun cannon salute from the Royal Canadian Navy Reserve. Winnipeggers and the Bombers basked in the glow of the new stadium right away. The Shriners raised over $30,000 for their hospital that night. The team beat the Rough Riders the next day. By the time the exhibition season was over it was found that the stadium was already too small for the massive crowds that it was drawing. An additional 850 seats were immediately installed and more were added before the season was done. Oh, and remember that challenge of Foster Hewitt ? Well, the Bombers DID make it to the CFL finals that year but lost to the Hamilton Tiger Cats. There were a number of nicknames given to the stadium. Some referred to it as the House That Calvert Built, for Bomber President Calvert Riley. 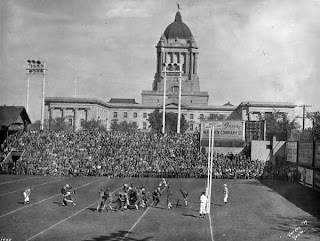 Others called it the House That Jack Built in honour of "Indian Jack" Jacobs, the Bombers' star quarterback who fueled the sellout crowds in the years leading up to the opening of the new stadium. The city saw a great deal of growth between the 1950s and 1970s and both the stadium and arena were soon too small to hold the crowds that they could attract. This impacted the teams that played in them and the profitability of Winnipeg Enterprises, a city owned Crown corporation. In December 1971 Winnipeg Enterprises approached city council with a $1.5 million plan to add an additional 6,583 seats to the west stands of the stadium. It would also include a canopy, new press area and washrooms. The city agreed and work got underway in March. Construction went smoothly and the stands were open in time for the Bombers' regular season. In December 1975 Allan Finnbogason, chairman of Winnipeg Enterprises, appeared before the finance committee of city council to pitch a nearly $11 million expansion plan for the arena and the east side of the stadium. Council defeated that plan in the spring of 1976, but the pressure was kept up by Jim Ernst, the next chairman. The following May, the money was added at the last minute to the city budget and Winnipeg Enterprises began planning for an 8,253 seat expansion to the east stands. The architect was Michael Rattray of MMP Winnipeg with the steel provided by Dominion Steel, the same companies involved in the 1972 expansion. The east stands expansion ran over time and over budget. It turned out that the cost estimate provided to the city by Winnipeg Enterprises was way off - by almost $1 million. At a special meeting of council, some, such as Alderman Frank Johnson, were incensed: "If any ordinary business enterprise had made an error of this magnitude - heads would roll. We’ve been suckered but I don’t know by who”. 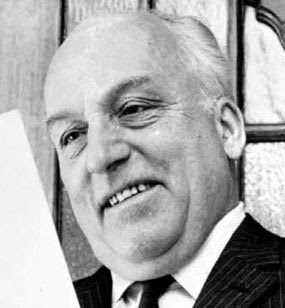 Others agreed with Ernst that the error due to the cost of steel and concrete was not the fault of Enterprises, but of the contractors who provided them. In the end, council agreed to fund the shortfall. 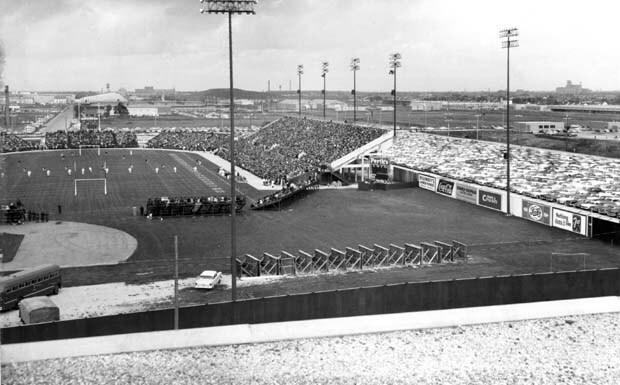 Work began in early 1978 and was expected to be completed for the Bombers' first exhibition game on June 14, but things came to a halt in May due to a province-wide strike that saw thousands of electricians, plumbers, steamfitters and sheet metal workers walk off the job. The strike did not end until October and the Bombers, which had sold thousands of season tickets for seats that did not exist, ended the season deep in the red. In 1988 the stadium underwent $3.5 million in renovations to install artificial turf and upgrade electrical systems. The name died off the pages in 1949. There is nothing that I could find as to why it was dropped. The 1947 naming contest had 30,000 entries and the certificate for the winning entry was presented by Mayor Coulter himself. Given all that, it does seem odd that it died out just two years later. Interesting story - very informative. When did the expansion(s?) take place, and how did the stadium evolve into its present-day form? ?